I cannot imagine having the bathtub jut right up against the kitchen sink, out in the open, but that’s just me. I would have closed it off and made that nook a big rain shower (the toilet is opposite in a closed off room). The apartment as a whole seems like it belongs somewhere in Europe, don’t you think? Could you live in a place this small? I’d need a writing desk for sure. I want to downsize, but this is a bit much, I think. 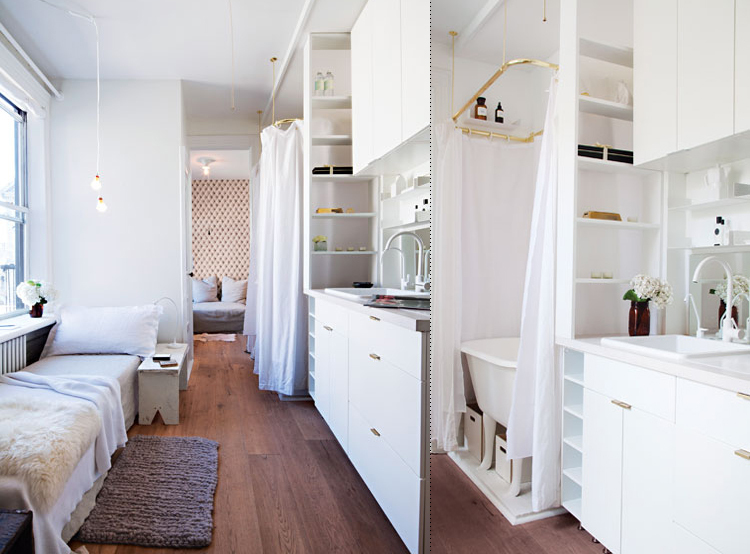 I love the tiny house movement, but the problem I have with all those gorgeous tiny houses is that they usually make the bedrooms lofts. Makes perfect sense, but I just can’t see myself growing old in a loft, ya know. Feels like regression back to college days. And does that kitchen even have an oven? i think the galley style makes me feel really claustrophobic. i mean i like it. i love the styling and the little touches, but no, i could never do it in a million years. it’s just too narrow for me, i’d be sitting on that bench and the whole time thinking “i am so close to the sink, i am sitting in my kitchen , wait no it’s my bathroom.” and i’d just be on some sort of constant loop of those kind of thoughts. though in my fantasy world i do have a little cottage behind my house (a real house also being part of that fantasy) and it’s one room, with a loft, and there’s a bed in the middle and a big farm house table and an old desk and maybe a little kitchen and a fireplace – i’d say it’s about 500 sqft, but it’s square and has that loft. And it’s decorated in a shabby chic style if you are wondering. 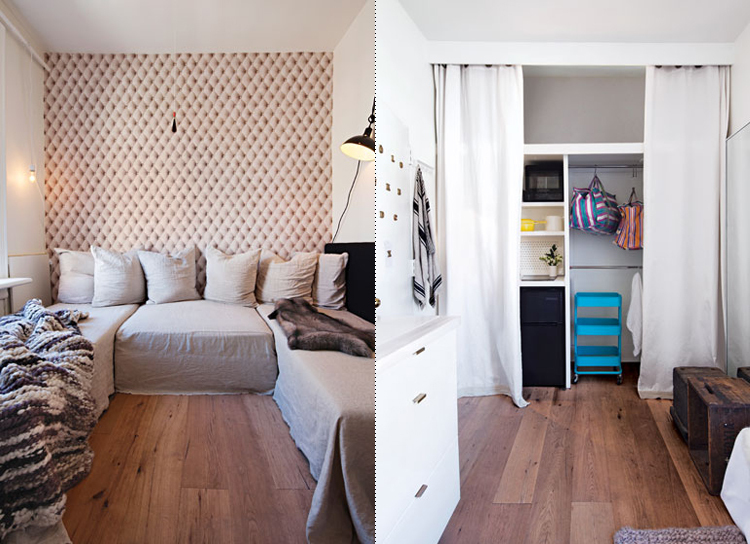 i love the idea of a small cozy space but i think this one here might be small europe even (probably not). I could clean it in 30 minutes! even though it is small, it looks so airy and bright. i love the gold bar above the shower – something about the shimmery surface makes even the small things seem a little bigger. its totally european like a pedatare (my french spelling is bad) I could see this as a total crash pad but I don’t know if I could make it a home. the frightening thing is, for a NY studio, this is nowhere near as small as they get! i could do this in my retirement, when the bf and dog have moved on to the dogpark in the sky. but the burlap has to go…. i lived in a studio flat about half that size for 2+ years… i’m not sure i could go back there again… having said that, had my studio looked like that i might have stuck it out even longer… love the bedroom/lounge treatment… the feature wall & furnishings work for me! on second glance, is that lounge not the bedroom? is the bed seriously in the kitchen? what the? oh, nice one! shall have to have a gander… yes… my front door opened onto my bedroom/lounge which had room for a fold-out bed, a coffee table (which had to be pushed out the way if you wanted the bed open) & a fold-out cafe table & chairs tucked under the window… my kitchen was the hallway to the bathroom/laundry which tucked in behind the “bedhead” wall (no room for a bath, just a shower that kept getting blocked & the world’s teeny tiniest washing machine… though impressive that they could actually squeeze that in at all)…. there was a titchy wee coat cupboard, but i have no recollection whatsoever of where i actually put my clothes! Oh so lovely, and so unbelievably clever! Not sure I’d manage a small space as well as they have. 1. i’ve seen something this small at an IKEA store, and been impressed with their storage. 2. it’s only cute because it’s perfectly clean. if you left some books or newspapers around, whew!